Don’t want to miss our updates and the latest from the field, please sign-up here. Jack of all trades, master of none. My mobile phone is my map, camera, GPS, clock, weather update, music player, torch and book reader. It does everything that the other four gadgets (listed below) do. Yet a mobile phone is not foolproof. Its biggest limitations are fragility and battery drain. There is a market for a rugged smartphone like the CAT 60, yet I would not recommend them for trekking. Why? because they cost a bomb (Rs 50,000 on Amazon on June 2017) and come with mediocre internals. Also, I would never put all my eggs in one basket. A non-functional smartphone means I have no light, navigation or camera. A frightening prospect. Instead, I recommend investing money on a tough case for your existing mobile and investing in these dedicated gadgets. I currently use the Lenovo P2. It comes with a massive battery, decent internals and a fantastic screen. Covered with a tough case, it makes an excellent trekking companion. A mobile flashlight suffices for those minor tasks like finding things in your tent. Yet a headlamp is invaluable when you want light while keeping our hands free. Headlamps usually take batteries or are USB rechargeable. I prefer lamps with interchangeable batteries for long and hard treks, where I need the redundancy. A USB chargeable headlamp is reserved for shorter, less expedition-like hikes. Nowadays, I have taken to carrying a small single cell torch to augment my headlamp. Read our complete review of this flashlight. 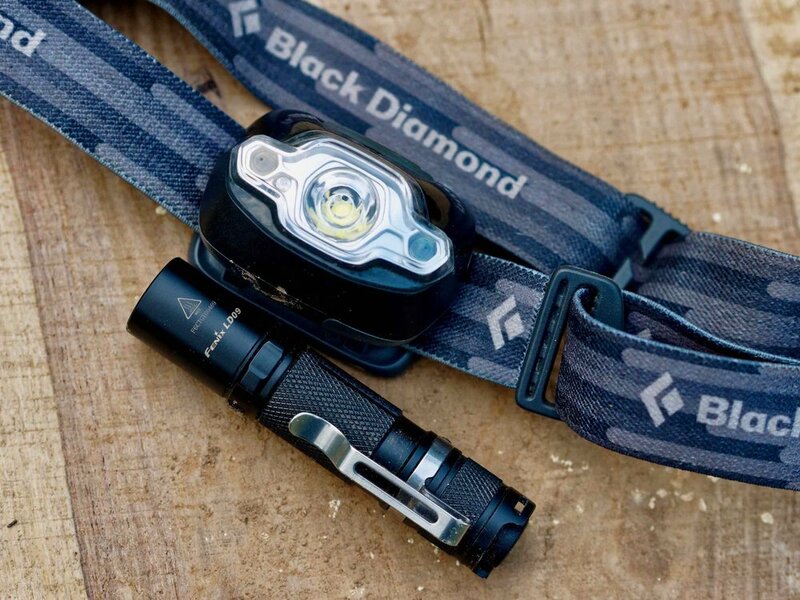 I use the Black Diamond Storm headlamp, though sadly it's not available to buy in India. I would like to suggest the Fenix HL50 if you're considering buying a headlamp. The Fenix features an exceptionally tough full metal build, that weighs only 57-grammes and takes an AA battery. A smartphone with a Rs. 1000 app is "almost" as good as a dedicated GPS device. "Almost as good" because in GPS mode the mobile battery dies in 6 hours. Duh! On the other hand, a self-respecting hiking GPS device is water/freeze and shock-proof and comes with a replaceable battery. It is no surprise that my trusted Garmin Etrex 20X GPS device was #1 on our "Trekking Gear of the Year 2016". A mobile in a good photographer's hands will take great photographs. Yet, that being said, sometimes I will need to pluck those extra electrons from the fading light. Something only a decent-sized camera (with a larger sensor) makes possible. I normally stick to one lens even on an interchangeable lens camera. Changing lenses and keeping them clean in the field can be a pain in the hmmm neck. It is never a pleasant sight to see your pride and joy roll along the side of a mountain or into a stream. Unless you have a complete weather sealed camera and lens, make sure you have a waterproof cover or a garbage bag (yes! field tip) to keep your gear dry. My favourite camera in the field is the Sigma DP2 Merrill, featured in the photograph above. It has weathered five seasons with me and I can't seem to love another camera more. I'd recommend the Canon EOS 1300D if you have been deciding on which camera to buy. The Canon is far more versatile than the Sigma and it makes a great entry level DSLR without breaking the bank. Although there are other ebook readers, yet Amazon's Kindle is the defacto standard. On days when the weather turns bad and I am confined to my tent or I don't feel like walking, a good book is my best companion. With an ebook reader, I can carry a book for every occasion without worrying about the additional weight. 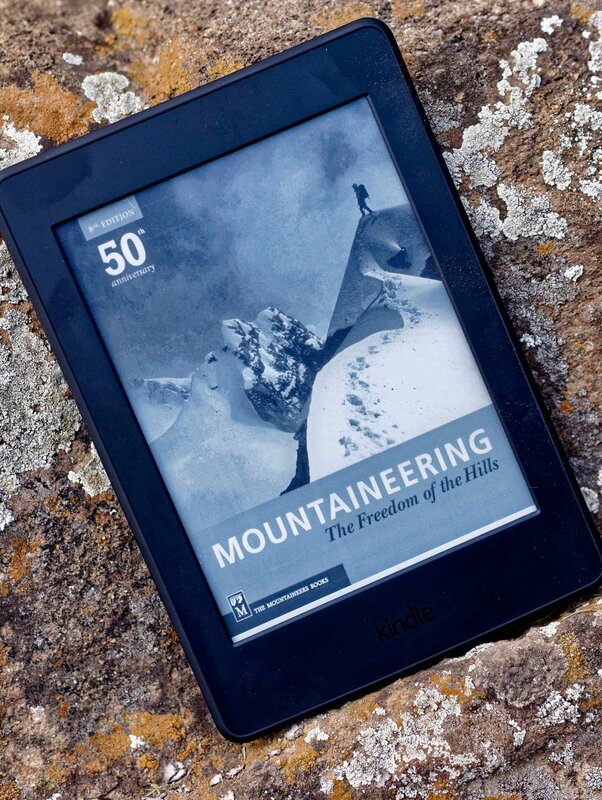 Moreover, ebooks have phenomenal battery life that will outlast any Himalayan trek on a single charge. Other benefits of an ebook reader include easy availability of titles and lower costs as compared to a physical book. I'm currently reading 20000 Leagues Under the Sea (again) on my Paperwhite. “Nature's creative power is far beyond man's instinct of destruction.” Jules Verne is one of my absolute favourites. Kindle Paperwhite has built-in front light, so you can read comfortably without eyestrain in any light. And not the least on this list - don't forget a way to power these gadgets. Thankfully we've reached a point in time where most gadgets are USB rechargeable. Therefore, it makes sense to invest in a battery pack that will give these devices a boost when needed. Though I rely on chargeable batteries for most of my gear, a Powerbank and a heavy-duty one at that (the more mAh, the better), will ensure you never go power-less. I've recently added the GoPro Hero 5 Black to my gear and with it, I need to carry my Mi 10000 mAh powerbank. If I had to buy one today, I'd go for the 20000 mAh model. Not only does it feature double the battery of my MI 10000 but it comes with support for charging two devices at one go. Did this list stimulate your gear neurones? Respond, criticise and suggest your own “gadgets” in the comments section below. Liked what you read? You can sign-up to receive more updates and stories from us. Feb 5 What’s in our camera bag?